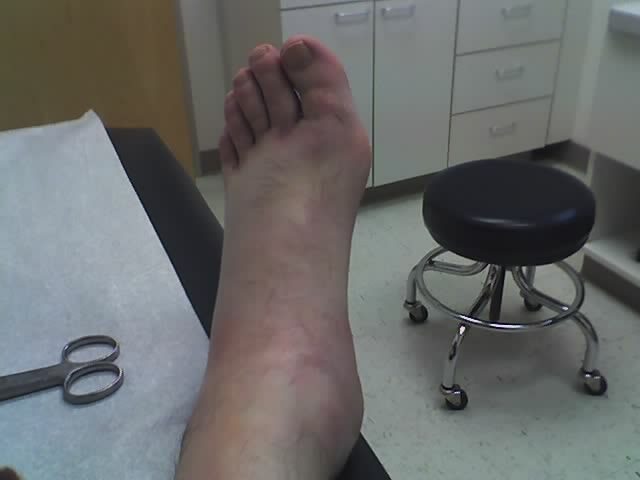 As learned in hilarious detail here, my foot and ankle are no longer the picture of skeletal bliss. * Peeing. Thank goodness for walls to steady myself against. And if you're wondering about just sitting down...well, I'd just have to stand up again, and that's a hassle. Try it with crutches. You'll see. * Carrying--anything! But especially meals. Last night I ate in the kitchen. For lunch, my friend Doug brought over Chipotle. For tonight's dinner, I resorted to one crutch so I could make three trips with food and drink. For other stuff, I'm using my trusty backpack. * Laundry. I needed to wash clothes today. The machines are in the other apartments, three dozen lurching steps away. How to carry the clothes? Backpack! How to carry on the return trip? Backpack, plus hangers off the little carry loop on top. 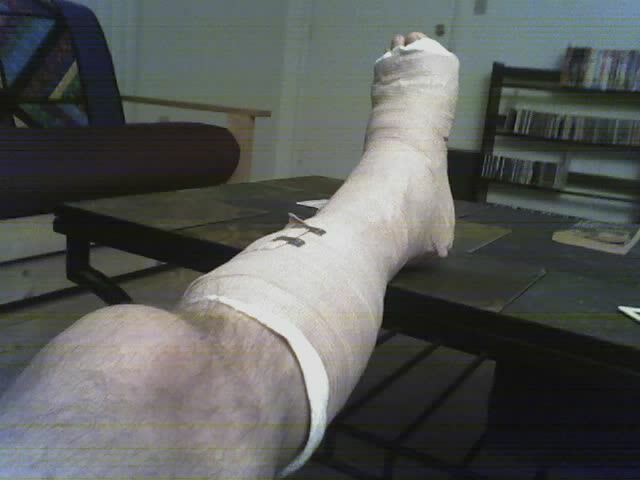 I looked (as I remarked to Elaine) like a crippled Batman. * Showering and/or bathing. I couldn't shower, because the splint couldn't get wet and I felt not at all like strapping a garbage bag to my leg. The bath was fine, as long as I didn't think about slipping and cracking my head against the sink. 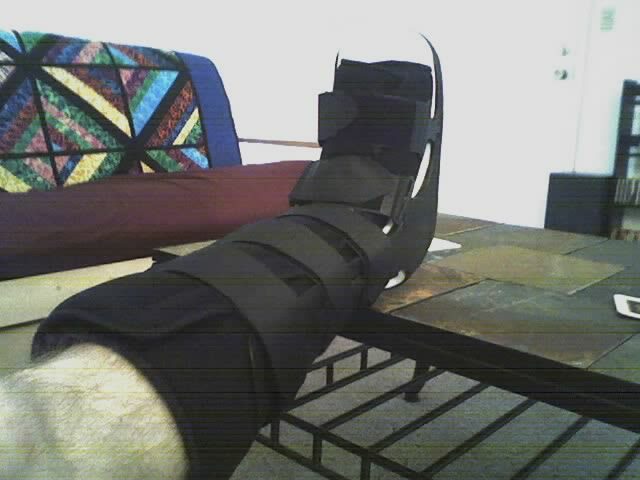 With my new boot (see below), this should be easier. * Groceries. Dave and Jennie are going to do me the favor this weekend, but I need a better solution. Hmm. Backpack? Pizza? Online grocery shopping? 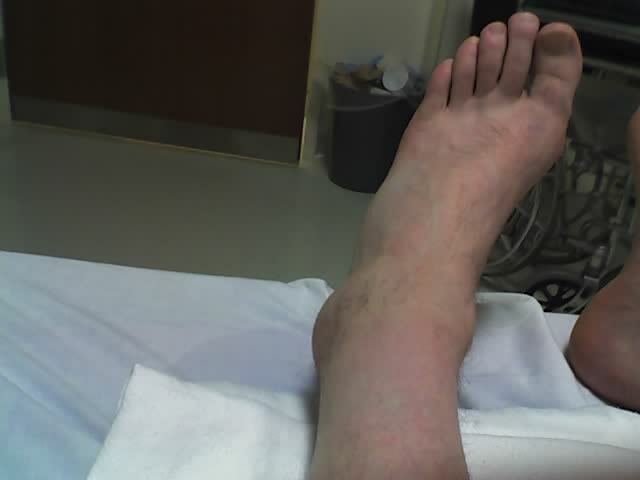 I saw the orthopedist today, and he started by saying "We're going to take another x-ray. If you're lucky, things haven't shifted. Otherwise, you'll need surgery." I was lucky. No surgery. Here are photos starting the night of the injury. Nothing better to do while waiting for help than take pictures of my leg. 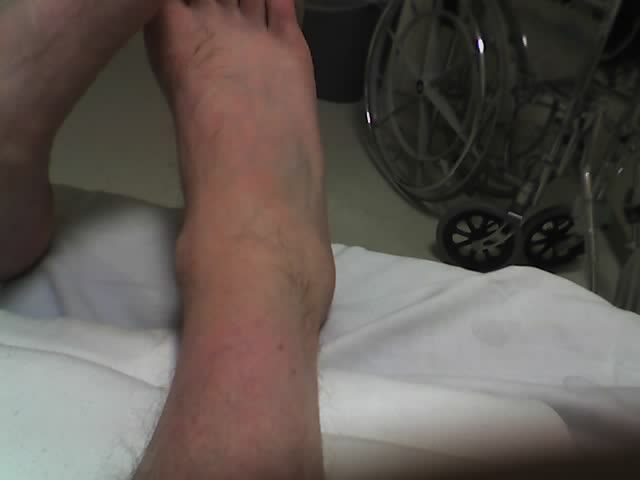 My bad foot. Notice the small blimp growing out the left side. For comparison, the way it should look. In a professional splint on Wednesday. And, on Thursday, cut out of it. I have now swelled up to elephantine proportions. I've been given the boot before, but not like this.